It all started when I saw this report quoted in Mattogno's book "Belzec." 22 Meldunek nadzwyczajny z miejsca tracenia w Belzcu z 10.VII.42r, SPP, Jcha 15, poz. 81. The report was later included as “Annex 3” in the long account (Sprawozdanie No. 6/42) drawn up in London on December 23, 1942, by the Interior Minister, St. Mikolajczyk, of the Polish government in exile. HILA, Stanford University, Box 3, pp. 63f. So how did the pits get this big? I think the clue lies in looking at Treblinka. Yitzak Arad claims in his work that Treblinka also had pits dug thirty meters deep. Excerpt from: Yitzhak Arad, Belzec, Sobibor, Treblinka. The Operation Reinhard Death Camps, pages 349-359. In a comment attached to this report, it was noted that there was no corroboration from any other source for the item about "mobile gas chambers". In this report, Treblinka is mentioned without being called an extermination camp, and it is possible that it was not yet clear to the Underground that two Treblinka camps now existed the labor and penal camp, and the extermination camp. In the Information Bulletin of September 8, 1942, the "Treblinka extermination camp" is first mentioned as separate from the labor camp. The Treblinka extermination camp, the place where the Jews are being killed, is located near the labor camp. It is situated 5 kilometers from the Treblinka station, and 2 kilometers from Poniatowo station. There is a direct telephone line to Malkinia. There is an old camp (for Poles) and a new camp whose construction is still underway (exclusively for Jews). The extermination of the Jews is now carried out in a way that is completely independent of the old camp. A locomotive pushes the cars with the Jews to the platform. The Ukrainians remove the Jews from the cars and lead them to the "shower to bathe". This building is fenced off with barbed wire. They enter it in groups of 300-500 people. Each group is immediately closed hermetically inside, and gassed. The gas does not affect them immediately, because the Jews still have to continue on to the pits that are a few dozen meters away, and whose depth is 30 meters. There they fall unconscious, and a digger covers them with a thin layer of earth. Then another group arrives. Soon we will relay an authentic testimony of a Jew who succeeded in escaping from Treblinka. 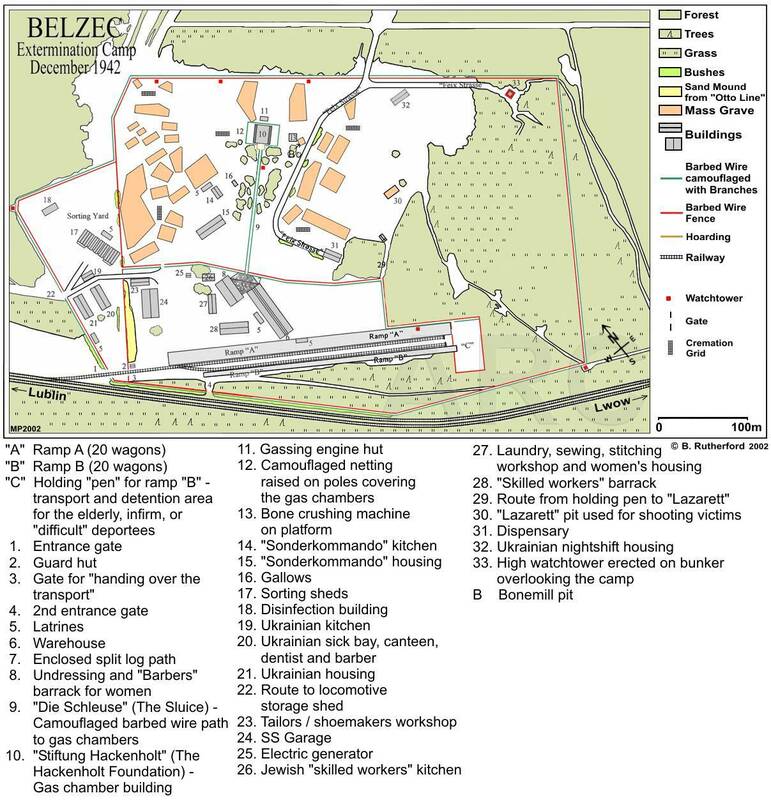 In this edition of the Bulletin, there already appears an accurate description of the gas chambers as a permanent structure, and not as mobile units as was cited in the August 17 report; on the other hand, the description of the victims walking dozens of meters to the pits after the gassing is not true and is based on unreliable information. The death camp continues its activity. Transports arrive from all areas of the General Government (lately from Radom, Siedlce and Miedzyrzec). At present, not twenty but only ten freight cars are taken to the platform, as it takes a long time to get rid of the corpses of those who died on the way (20-30 percent). The gas chambers are operated in the following system: outside the building, an engine works twenty-four hours a day. Its exhaust is connected to the wall of the barrack and through it the gas is introduced. The gas is a combination of poisonous liquid mixed with the gasoline from the engine and kills the people who are locked in. Within the camp, in addition to the Jewish workers, there is a Jewish orchestra and a group of Jewish women for entertaining the staff. By the end of August, 320,000 Jews were murdered in Treblinka. So if getting a pit thirty meters deep was done with an excavator at Treblinka, that must have been the only conceivable way to get it done at Belzec as well. However, we must keep in mind that with regards to this 1942 report from Belzec from the polish government in exile, they claim this authentic report came from a German who worked there. There is an interesting thread over at axishistory. They are talking about the excavator at Treblinka and eventually it gets into the one allegedly used at Belzec. Despite the fact that it drifts away from solid evidence of an excavator at Belzec, it goes into some other interesting historical aspects. I will say that the entire thread is worth the read because there is a lot of debate about the many labour camps in the Belzec area, where they were located, when they were shut down, when the alleged extermination camp started up, whether or not it was in the same place as one of the former labour camps, the credibility of Reder overall especially in relation to his testimony about Jirmann who as it turns out was shot by Heinrich Gley in an accident, and many other things. What I found interesting is that Michael Mills who has certain shortcomings as noted by me here, seems to be a quasi revisionist in that towards the end, he doesn't write off the idea that Belzec could have been a killing center in the early forties. In the thread, people focus on OTHER elements of events on Belzec to attempt to establish the crebility of Reder as a witness. Which is fine if they wish to do so. While it is true that if Reder is probably correct on some things, such as the accidental killing of Jirmann by Gley, it has no bearing on the SCIENTIFIC EVIDENCE of gas chambers and 600,000 gassed inmates or not. It is interesting, but seperate. The number of bodies claimed to have been gassed, buried, and then exhumed and destroyed once again is impossible; even if there was an excavator at Belzec. Besides, the absurd murder stories coming out of Belzec as noted by Mattogno pretty much prove how the whole Aktion Reinhardt story seems false. The atrocity stories would not have circulated if there was no need to and everything was truly documented and known about Belzec. That being said, let's continue about excavators at Belzec. The only photos of death camp excavators were taken by Treblinka camp kommandant Kurt Franz. According to the Franz photo album, the SS used cable excavators in Treblinka(Menck & Hambrock type Ma). Can anyone confirm that excavators were used in Belzec and Sobibor for the digging of burial pits? Rudolf Reder testified in 1945 that he operated an excavator in Belzec. Thanks Xcalibur. Looking a bit further I found that in September 1942, a request to purchase two bucket excavators from a company in Holland was made by Odilo Globocnik to Untersturmführer Hans Offermann. These two excavators may have been destined for Belzec. Also, Kurt Fran'z photo album of Treblinka "Schöne Zeiten" translates as Pleasant Times. Not really the words I would associate with Treblinka. Was he being sarcastic!!! Actually, he claimed that as a mechanic he serviced an excavator operating outside the camp at Belzec. He stated that the excavator he serviced was digging ditches, but he did not specify that the ditches were graves. It is most likely that the operation he was referring to was the construction of the huge anti-tank ditch in the period before the invasion of the Soviet Union; the village of belzec was situated right on the demarcation line between the German and Soviet zones of occupation. The Belzec camp was situated immediately adjacent to the anti-tank ditch, and probably originally housed forced labourers working on the construction. Once the invasion of the Soviet Union commenced, work on the anti-tank ditch was discontinued and the camp abandoned. Refurbishment of the camp began later in 1941, perhaps initially as a transit camp; it was converted into a killing centre in March 1942. There is a possibility that the anti-tank ditch, which of course was still there, was used for disposing of the bodies; that at least is what emerges from Eichmann's post-war testimony. Please give the quote in context. Does Reder mean outside the death camp (Lager II), outside the Belzec death camp proper or what? "I operated a machine which dug the earth out of pits which served as graves for those gassed." "On August 17, 1942 I as deported to the Belzec extermination camp." Mir als Maschinisten trug er auf, den Benzinmotor eines Baggers, mit dem in der unmittelbaren Naehe des Lagers riesige Gruben ausgehoben wurden, zu bedienen. In diesem Charakter arbeitete ich 2 Monate lang. Weitere 2 Monate, das heisst bis Ende November, arbeitete ich als Maurer beim Ausbau der Lagerkueche. He [= Lagerleuter SS-Stabsscharführer Irrmann] gave me as a mechanic the task of servicing the petrol engine of an excavator with which gigantic ditches were being dug in the immediate vicinity of the camp [my emphasis]. I worked for two months in that capacity. For a further two months, that is until the end of November, I worked as a bricklayer on the construction of the camp kitchen. Source: Document 164 (c) “Vernehmungen über das Vernichtungslager Belzec: Rudolf Reder, Ueberlebender des Lagers, 29.12.1945”, in the book by Peter Longerich “Die Ermordung der Europäischen Juden” (pp. 362-7). In other works, the gigantic ditches were next to the camp, not inside it. That description fits the anti-tank ditch, which is right next to the camp, between it and Belzec railway station. Perhaps Xcalibur will be so kind as to give us the source of his quote, ie not just a book by Sherman, but where Sherman got it from. A bit more context, please. This quote doesn't clarify what Reder is referring to when he says "in the immediate vicinity of the camp". You should also endeavour to find the original version (Polish? ), if you wish to bicker and extrapolate on the correct translation of the passage and whether Reder was in Belzec extermination camp or the labor camps in the area two years earlier. ...as I said in my previous reply, the quote can refer to the Lager II or the extermination camp in general (as you seem to interpret it). Now does anyone know the source or sources for xcalibur's claim in post #2 that "in September 1942, a request to purchase two bucket excavators from a company in Holland was made by Odilo Globocnik to Untersturmführer Hans Offermann. These two excavators may have been destined for Belzec." I have seen nothing so far and nothing shows up in Mattogno's book "Belzec" or even in "The Extermination Camps of Aktion Reinhardt." taken early in the fall of 1944 reveal the signs of machine digging. The time of day was such that low sun angles resulted in shadows giving away subtle features not otherwise visible. The boxed regions contain mounds piled up by the excavator(s) while opening and closing the graves. In the drawing at the bottom, the outlined area has been drawn to show an equivalent oblique view. The drawing shows that a system of regular piles of soil separated by shallow ditches result when an excavator first opens, then refills a grave, and then moves to an adjacent patch of ground. We click on a link to this image. So we have a claim that the excavator was used at Belzec and then shipped off to Treblinka. Well we shall see about that. Last edited by Werd on Tue Jul 08, 2014 9:56 am, edited 4 times in total. Re: Excavators at Belzec? Proof? Claims? 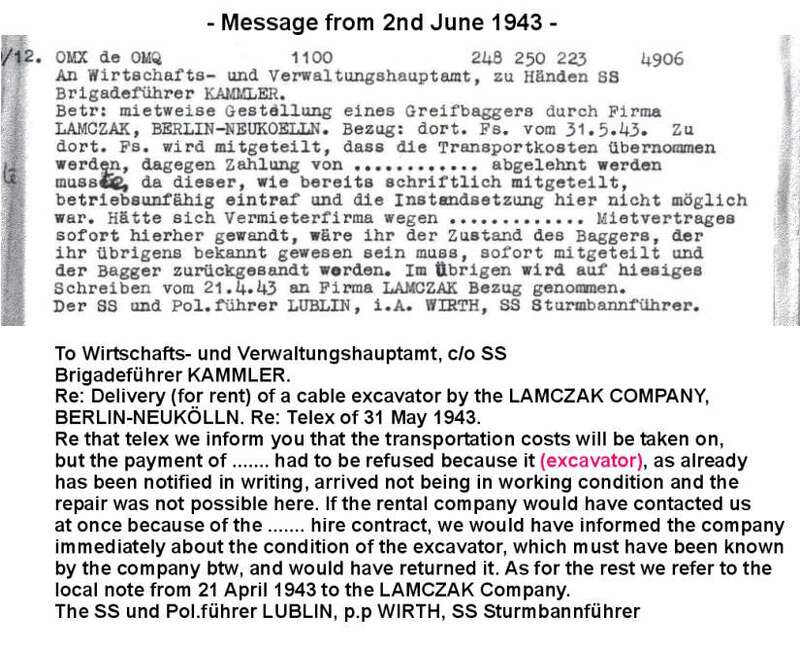 On top of what we have above, we know that Rudolf Reder testified in 1945 that he had used Menck & Hambrock type Ma excavators at Belzec (whose commission would have come through the same channels as that of all the Aktion Reinhardt extermination camps, likely one of the two bucket excavators to be purchased from a company in Holland, requested by Odilo Globocnik to Untersturmführer Hans Offermann in September of 1942) which, as he testified, "dug the earth out of pits which served as graves for those gassed." When a) there was no quarry at Belzec and b) Reder, who operated nigh identical equipment (Treblinka used cable and not bucket excavators), declares that it was used for digging burial pits, the evidence suggests to me and all other reasonable human beings that they were being used for purposes other than gravel removal, especially when slave labour was on hand to do the job anyway. Eichmann's post-war testimony further corroborates that ditches dug at Belzec by virtually the same equipment were used for corpse disposal, just as in Treblinka, reinforcing the conclusion already arrived at by aforementioned evidence. The deathcamps site may be closer. For digging the huge burial pits in the Aktion Reinhard death camps the Nazis used big excavators. The only photos of death camp excavators were taken by Treblinka camp commander Kurt Franz. The photos were found in his Treblinka album "Schöne Zeiten" (Pleasant Times). In Belzec and Sobibor excavators surely were used also for the same purpose. ARC is the only website which can show all photos of the use of excavators at the Treblinka camp site. On 4 September 1942 Globocnik sent a telegram to SS-Untersturmführer Hans Offermann in which he ordered two excavators, perhaps for Belzec. According to the Franz album photos the SS used cable excavators in Treblinka, not bucket excavators. Maybe Globocnik could not get the two Dutch machines and choosed other types. Perhaps he realized later that bucket excavators were not useful for digging the burial pits. Who knows for what else he could have ordered these excavators. Offermann was part of the Lublin Personalabteilung (personnel department), so perhaps Globocnik sent him to Holland to look for earth moving equipment. So if I am to understand the storyline, Reder and other Jews used excavators to dig pits that were either originally anti tank ditches which were later converted into corpse ditches after the Belzec camp changed into an extermination phase, or they were to be graves from the start of their digging. But then the Jews who dug the pits with the excavators were supposed to have been killed and then then next back of transports of Jews would be used to dig more pits? This brings up other questions. 1. How many batches of transports were there in Belzec and on what days? 2. How many Jews on each transport? 3. What was the total volume of each pit? 4. How long would it take two Jews to operate two excavators to dig each pit depending on the size? What is interesting is that a request is made for two excavators in September 1942 that are supposed to have gone to Belzec. And they say it was realized at Treblinka that bucket excavators were not useful for digging huge burial pits. Well then so what the hell was used at Belzec? The same things used at Treblinka. If so, that would seem to throw what others have said about these two bucket excavators being destined for Belzec into disrepute! Why would you claim that a request for two excavators proves they were sent to Belzec to dig mass graves, but cite a document that requests two bucket excavators and then the request is not honoured! Also, if later in June 1943, there is a telegram indicating that there is a problem getting at least one of the excavtors to actually be in working order, it would make it harder for the Nazis to take 800,000 bodies at Treblinka and 600,000 at Belzec and bury them and then dig them up again later. Right? Oh yeah. If an order was allegedly placed for two excavators in September 1942, so that they could be put in Belzec, how in the hell were Jews digging pits thirty meters deep without an excavator back in July 1942 and prior? Because that is when the original atrocity story was published by the polish government in exile. Those who operated the Belzec extermination camp were so murderously efficient that only a handful of prisoners escaped death after entering its gates. Only one of those survivors, Rudolf Reder, has provided extensive postwar testimony about Belzec, according to Holocaust scholar Christopher Browning. Reder, a mechanic, would emigrate to Canada in 1953. He died in Toronto 15 years later. According to his testimony, Reder was sent to Belzec on Aug. 17, 1942, on one of 50 cattle cars crammed with people. After the cars were unloaded, he said, the prisoners were stripped naked and certain skilled workers were asked to step forward. Reder, a mechanic, was one of eight men chosen to join the Jewish labour force. The rest of the prisoners, he said, were immediately gassed. Reder spent four months at Belzec, where he worked as a mechanic, repairing an excavator. Browning, who testified as an expert witness against Holocaust denier Ernst Zundel in Canada, includes Reder's testimony in a report produced for a British court that catalogues the evidence that proves the "Final Solution" was a deliberate Nazi policy and indisputable history. Well we seem to have a break in the chronology here. If Belzec is not supposed to have had any excavators in September 1942 as some have claimed - because that is when the order was put in for them, then what the hell was Reder working on when he got there in August? Or did the excavator come a bit later after him like in September or October? Or was it already there before his arrival in August 1942? When exactly did he start work on this thing? Did he get specific? If it was there before his arrival in August, that may explain the polish government in exile's report of 30 meters deep if it was already being used by other Jews, but it does not explain the absurd story of death by electricity. And of course, one of the most illuminating comments I have ever seen in regards to Reder. I am glad I found it on a site which hosted a Kues article. After reading all this carefully, it becomes clear that Rudolf Reder was nothing more than a gestapo agent and nazi collaborator during the war, and a Communist stooge afterwards. Does it not seem strange that he served the camp authorities at Belzec diligently for over four months, and then he - and only he - was escorted into Lemburg with five Nazi officers and allowed to escape near his former housekeepers home ? - How convenient. He stayed there until the end of the war, and no doubt that is where the Polish communist police found him hiding. Upon his arrest they put it to him straight - either you collaborate with us, and help construct a false myth about Belzec being a death camp, with gas chambers and horror stories etc., or you'll be on the very next transport to the Siberian gulag. Well, Rudolf Reder had no choice did he - and that is why his fabricated story has been presented to the world, and we've been stuck with it ever since ! The preparation and digging of these graves would appear to have been made on an ad hoc basis with the early graves located in the north eastern part of the camp. Many graves were close together and when the exhumation and cremation work commenced, the sides of the graves would have collapsed, thereby rendering any accurate record of grave sizes difficult. This suggests a hurried sealing of the ground, destruction of any identifiable border which in turn made the archaeologist’s work more difficult and their findings less precise. In addition, a mechanical excavator was used to remove the top layer of soil and remove the corpses, and then refill the pits with the cremated human remains and ash. It has been suggested that some of the smallest graves (e.g. Nos. : 13, 27, 28, 32 and 33) could have been the execution pits in which the old, sick and infirm Jews were shot during the first phase, while graves 2, 21 and 23 could be the execution pits from the second phase. The smaller graves correspond with sketches and written descriptions of the camp layout during the second phase (July‑December 1942) by members of the former SS‑garrison. Photo of the Mechanical excavator in Treblinka, which had previously been used in Bełżec. So Reder was in Belzec August until about Christmas in 1942. He serviced an excavator that either showed up later during his stay, or was already there before he arrived in August to service it and eventually use it. Well that is his claim anyway that he used it to dig graves pits. Let's attempt to construct a timeline or at least see if others have attempted. Burning of corpses at Belzec took place as early as August 1942, according to the testimony of Dr. Pfannenstiel. At that time cremation was not yet used as a means of body disposal per se but probably in order to help stretch the available burial space (judging by Dr. Pfannenstiel’s description whereby the corpses burned just partly and fresh corpses were placed on top of them thereafter), perhaps also for reasons of hygiene. The gassings, as far as I remember, were stopped at the end of 1942, when there was already snow on the ground. Then began the general exhumation and burning of the corpses; it should have lasted from November 1942 until March 1943. The burnings were carried out day and night without interruption, first at one and then at two fireplaces. One fireplace allowed for burning about 2,000 corpses within 24 hours. About two weeks after the beginning of the burning action the second fireplace was erected. Thus on average there were burned about 300,000 bodies at the one fireplace over a period of 5 months and 240,000 bodies at the other fireplace over a period of 4 months. Of course these are only approximate estimates. It should be correct to put the total number of corpses at 500,000. […] Again a short time later I was assigned to the burning detachment; the incineration of the dug-out corpses was a process so abominable humanly, esthetically and in what concerns the smell, that the fantasy of people who today are used to live under civil conditions probably is not sufficient to imagine this horror. The time given by Gley for the start of cremations, November 1942, is corroborated by the testimonies of Polish civilians living near the camp and the depositions of another Belzec SS-man and of one of the camp’s non-German guards; these witnesses also tend to confirm that cremations ended in March 1943 as stated by Gley. On the other hand, erasing the traces of the camp lasted until June 1943, and a witness noticed the stench of exhumed corpses as late as April of that year, so it is possible that corpses were burned at Belzec beyond March 1943. Deposition of Heinrich Gley in Munich on 07.01.1963, BAL B162/208 AR-Z 252/59, Bd. IX, f. 1697 ff. Gley’s estimate of the number of bodies cremated must be considered too high in light of the Höfle Report, whereby the total number of Jews deported to Belzec was 434,508. Eugeniusz Goch, in his deposition before examining judge Godziszewski in Zamość on 14.10.1945, BAL B162/208 AR-Z 252/59, Bd. VI, f. 1134-36, stated that the corpses were burned at the end of 1942 and the beginning of 1943, and mentioned having seen three heaps burning simultaneously. The same time span was given by Stefan Kirsz, who in his deposition before examining judge Godziszewski in Zamość on 15.10.1945 (translation from Polish to German as above, f. 1147-49) also mentioned several fires at once. According to Eustachy Ukraiński’s deposition before examining judge Godziszewski in Zamość on 11.10.194, BAL B162/208 AR-Z 252/59, Bd. VI, f. 1117-20, corpses were burned starting December 1942 and throughout the spring of 1943, with several fires burning at the same time. Stanislaw Kozak, questioned by Godziszewski on 14.10.1945 (translation from Polish to German as above, f. 1129-33), recalled two to three fireplaces and that the burning had started in late autumn 1942 and lasted for three months without interruption. In his deposition in Munich on 18.12.1963 (BAL B162/208 AR-Z 252/59, Bd. IX, f. 1831 ff), former Belzec SS-man Fritz Tauscher stated that upon his arrival in Belzec at the end of October 1942 camp commandant Hering had put him in charge of exhuming the corpses from the mass graves and burning them. He had gone to work immediately, and the corpses had thereupon been burned day and night without interruption, first at one and then at two fireplaces, until March 1943. Tauscher mentioned that some transports had arrived while the burning operation was going on and the corpses of their occupants had been burned together with the exhumed corpses. Deposition of Aleksandr Illarionovich Semigodov in Penza, 24.05.1973, BAL B162/208 AR-Z 643/71, Bd. IV, f. 704-11. The witness stated that the corpses extracted from the mass graves had been burned starting at about the end of autumn 1942, together with the corpses of newly gassed deportees. At the time Semigodov had left Belzec in March 1943, according to this deposition, the extermination and burning had still been under way (f. 709). Gerald Reitlinger, The Final Solution. The Attempt To Exterminate The Jews Of Europe, 1939-1945, 2nd revised edition, Cranbury: Thomas Yoseloff, 1968, p.148: "In April, 1943, a Jewish doctor, who later escaped to Switzerland, noticed the appalling stench of the exhumed bodies as he passed the spot by train." According to Eustachy Ukraiński (as note 5), cremation lasted throughout the spring of 1943. So Reder arrives in August 1942 and three months later in November, wholesale extraction of corpses from the ground begins in order to burn them up and bury them again. And this process ends in march 1943. So if I understand correctly they had an excavator in Belzec as late as winter 1942/43. Okay, so if the excavator in Belzec was later used in Treblinka, we would have to find out when the extraction of corpses is supposed to have occured in Treblinka. But let's refer back to a quote in Yitzak Arad's book I had earlier. It was posted courtsey of Roberto Muehlenkamp. So at the very least, we have a report dated from September 1942, claiming that diggers were being used. And in Treblinka, the Jews stumbled out of the gas chambers, dazed, nearly dead from the effects, and slowly walked to the trenches where they eventually fell into the thirty meter deep pits unconscious. Arad quotes this report for all to see and not even Roberto Muehlenkamp bats an eyelid. Because they had diggers to make the pits this deep. But partially gassed, wandering Jews? Furthermore, what are we supposed to believe now about this other source claiming that the excavator used at Treblinka was previously used in Belzec? Because now this is the chronology we have. 1a. August 1942. Rudolf Reder said he arrives in Belzec. - Reder. 1c. "in order to help stretch the available burial space (judging by Dr. Pfannenstiel’s description whereby the corpses burned just partly and fresh corpses were placed on top of them thereafter)"
5. April 1943 - A witness noticed an awful stench (so not all corpses burned away) - Thomas Yoseloff, 1968 writes about a Jewish doctor saying so in this month. Now if the burning of corpses began in August, it means they would have had to have been dug up before August 1942. Which means an excavator was probably there before August if the story is to make sense. And apparently it was still there until the end of 1942 if not a little bit into 1943 since that's how long it took to extract bodies for mass cremations. So the Belzec excavator, roughly, let's assume was there from July 1942 (and maybe June too) until December 1942/January 1943. Now if the excavator was there in August at least and probably even as far back as June for the story to make sense, why would an order for two excavators need to be placed allegedly for Belzec as stated here? 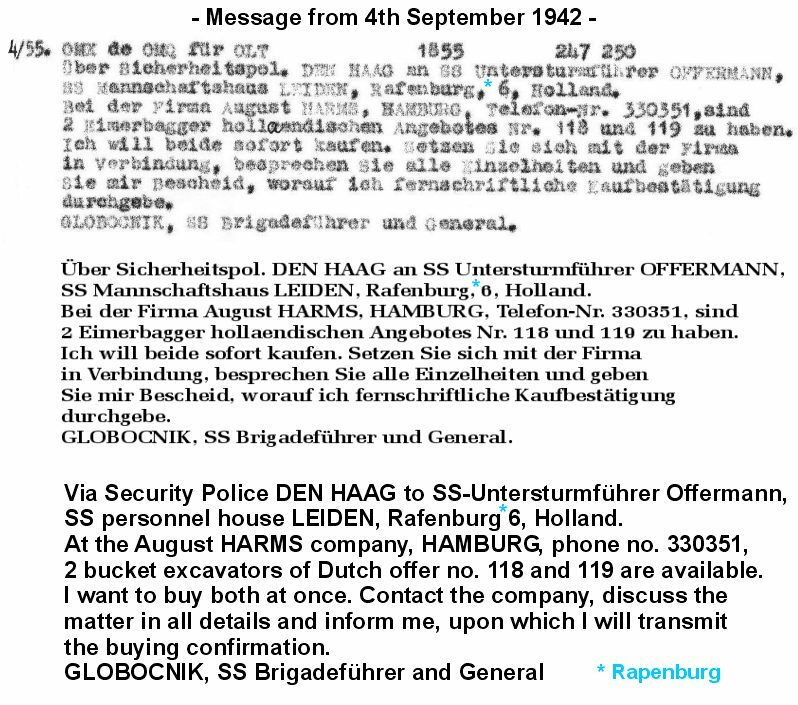 On 4 September 1942 Globocnik sent a telegram to SS-Untersturmführer Hans Offermann in which he ordered two excavators, perhaps for Belzec. What would be the point? Especially if Reder was so mechanically inclined that when he arrived in August 1942, he was able to successfully service the excavator that was already supposed to be there? As seen already this lead took us nowhere because bucket excavators turned out to be useless. The website even admits this is not a definite lead. According to the Franz album photos the SS used cable excavators in Treblinka, not bucket excavators. Maybe Globocnik could not get the two Dutch machines and choosed other types. Perhaps he realized later that bucket excavators were not useful for digging the burial pits. Who knows for what else he could have ordered these excavators. And furthermore, given the Information Bulletin from September 8 1942 regarding Treblinka, it is claimed at that time that jews were already being gassed and wandering dazed from the effects of said gas into grave pits thirty meters deep that were apparently already dug and waiting to be filled up. So Treblinka had pits being dug if not in the first week of September when this report was issued, but at the very least the pits were being dug in August and maybe even July. But hold on, that is the same time pits were supposed to have been dug in Belzec. So given how this above order for two excavators has no definite connection to Belzec, how can sources claim that an excavator was used in Belzec and then got moved to Treblinka and used there? What would be the point and how would it be possible since apparently an excavator was needed until January 1943 to take the corpses out of the ground at Belzec? Ignoring this glaring contradiction, consider something else as another nail in this ridiculous story about phantom diggers being in two places at once. The groundwater table in Treblinka, and I guess Belzec. At both camps it was claimed that in order to reach groundwater, one would have to go no more than 5 or 6 meters. So what the hell were these excavators doing allegedly digging grave pits 30 meters deep? What's next? A pump to get rid of all the water? If they dug that deep, the goddamn grave pit would have been flooded and it would have taken too long to try and pump all the water out. And where would they have pumped it to? Any credible witness statements about water pumps to displace the water in pits 30 meters deep? I have found none yet. Even if there are "credible statements" to that effect, digging 30 meters deep and letting all that water out from the ground would have been a time consuming disaster and rendered those pits unable to hold bodies since the corpses would have contaminated said water supply. The same supply that was needed to do dishes and laundry and even drink at times. Furthermore, soaked corpses don't make for flammable corpses either. however, one cannot exclude the explanation adopted by the official historiography, while giving it a different interpretation. If the Soviets had discovered mass graves full of corpses dead of disease or malnutrition, then they would certainly have exploited them for propaganda against the Germans, as the latter did in Katyn and Vinnytsya against the Soviets. lower portion, near the railway, and the highest point. 285 A. Kola, Belzec…, op. cit. (note 213), p. 22. 287 C. Mattogno, J. Graf, Treblinka, op. cit. (note 4), pp. 139f. I think some people in the field of holocaust research need to keep their stories and timelines correct. I think I have stumbled upon a huge contradiction. Good stuff Werd and most interesting to read your piece. However I feel that the story collapses entirely for me when they talk of a pit 30 metres deep. It just doesn't make any sense. Aside from the enormous problem of ground water, and collecting rain water we have the logistics of the pit itself. The type of digger shown in your picture would I think not be suitable. 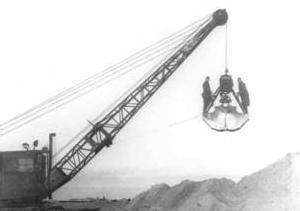 What would be required would be a shovel type of digger, like we see in general use today. The ground would be heavy and compacted and the type of digger shown, a grab bucket unit, isn't up to the job. In order to use a proper shovel front digger type they would have to have a ramp dug in to get down to 30 metres or 100 plus feet. This would be at least a hundred metres in length to get the shallow angle required, this means even more earth to dig and remove. As usual with a modicum of analysis the fairy stories these people have tried to force upon us are exposed for what they are. Good stuff Werd and most interesting to read your piece. Glad you liked it. I stayed up from 9:30pm until about 1:30am clicking around and reading. I slept for five hours and continued a bit more this morning. I read that whole topic on axishistory twice, among reading everything else. I was prepared to dump the Belzec story for many reasons for years but after exposing the contradictory chronology about diggers at Belzec and Treblinka, I am not perpared to merely dump the Belzec story. I am ready to set it ablaze on some railway grates. I sent this off to Mattogno via a website link that translated this entire topic. I wonder if he will respond. Probably too busy. His own personal blog has not had anything posted on it since last November last year. Given the fact that Belzec has been thoroughly uncovered as pitiful propaganda based upon a number of factors; I really think that debating the excavator bit is superfluous. Why bother? Curiosity. Plus I can't help but take pleasure in depriving the gas chamber mongers of one more weapon in their arsenal. Few things are better than turning their contradictory chronologies against them. Perhaps those were quantum excavators, Werd, and, like Schrodinger's cat who can be both dead and alive at the same time, could be both at Treblinka and Belzec at the same time depending upon who looked at them. Note that the M&H model MB is the larger machine but still has a boom only approx. 40 feet long. Since no other machinery is mentioned by Wiernik, how did the M&H both excavate AND STOCKPILE the material from a pit over 80 feet wide? Note also that it's equipped with a clamshell bucket. If such an attachment were used to exhume cadavers, the results would be a pile of mangled viscera and pieces of bodies. How could the resulting mash-up be sorted by gender, weight and age to then be placed in strict order on the cremation grill? Edit. Here is a link to a video of a much newer Menck dragline operating a clamshell at a construction site in Munich. https://www.youtube.com/watch?v=kC9sU7kue4I The excavation it's working from is at the depth of 10-15 meters with the deeper part extending to the left of the operating area. When hoaxers speak glibly of the Treblinka graves as described by Wiernik, that is the reality of what they're talking about. Now imagine digging that excavation and filling it to the top with a half million bodies then digging them up and cremating them to smoke, ashes and crushed bone all in 13 months. 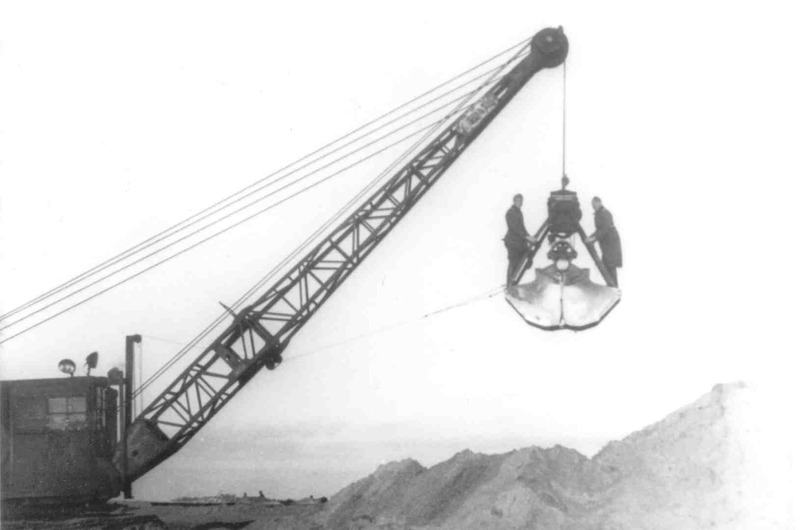 Remember, the only equipment you have are the three little draglines with clamshells, the Menck type MB and two type Ma, and a few pieces of tin and some wooden clubs to do the job. You must believe that if it happened, it was possible. Right?